I just couldn’t leave the brand’s most forgotten and oft-ridiculed segment out of this week-long celebration of all this buckle-ish. Shipwreck naturally lends himself to seafaring imagery, and it’s no surprise that an anchor would make several appearances upon his person. The decorative buckle, however, is a change for the Sigma 6 line. 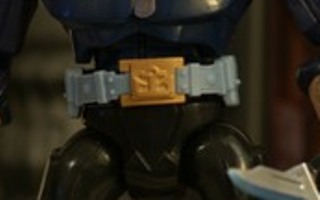 Most of the series’ figures were equipped with utilitarian looking clasps at their belts. Shippy, ever the iconoclast, prefers a jazzier look for his Sigma outfit. Being one of the later Sigma 6 offerings, the figure as a whole strayed from the uniform look that graced most of the line. Characters like Shipwreck here, as well as Lockdown, Inferno and the Dark Ninja Master, really started to take things into an interesting new direction. It’s a shame the segment didn’t last, as I think it was just starting to hit its stride. At least we got another amazing Joe buckle out of the deal. Nice throwback to the ’85 version.